Offered for the first time on The Attic! Beautiful front waterfall cabinet with unique grille design and tonal accents. A small Chicago based company, Howard made many of the Capehart chassis for them and supplied the military radios during WW2. Highly sought out by collectors, this will be a wonderful addition to your collection. The cabinet has been refinished using the very finest toning and finishing lacquers, producing a gorgeous finish. 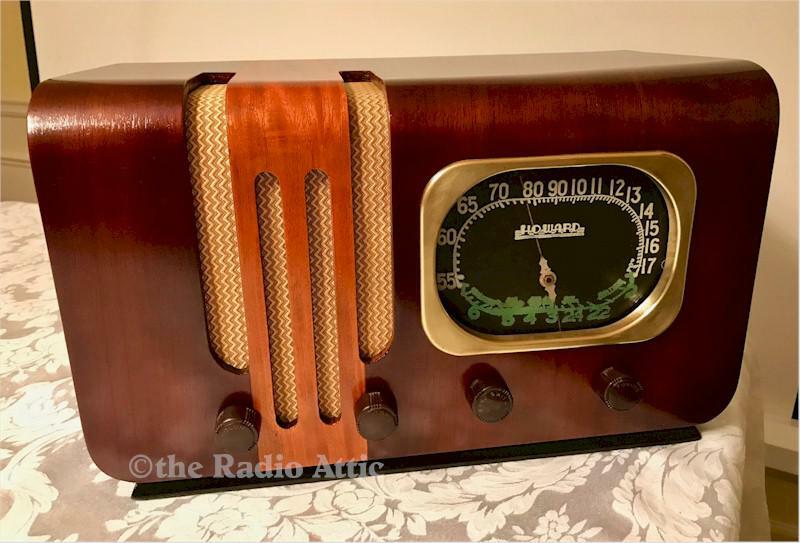 The electronics have been completely restored (no shortcut repairs and it is internally fused for your safety), and it plays very nicely on the AM broadcast and shortwave band. I have added a MP3 input so you may listen to your own supplied music if you wish. There is some slight fading to the lower painted shortwave markings on the glass dial, which is normal for a radio 80 years young. 15-1/2"W x 9-1/2"H x 7-3/4"D.